There are endless ways, combinations and recipes for whipping up the incredible egg! Just thinking for example: a beautiful egg omelet or poached egg for breakfast. For lunch or dinner we can whip up a range of frittatas. Then moving on to dessert, probably my most favorite, creme brûlée ....oh, I forgot, endless ways to prepare a souffle. The list goes on and on! The photos here were taken from eggs purchased from a local farmer, pasture raised. They appear to me to be much richer in color and remarkably tasty in flavor. 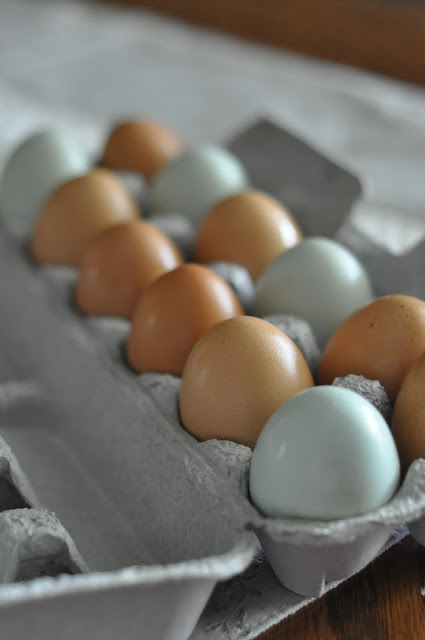 Now that it is springtime, the hens are in full production having more daylight to run around in the green pastures dropping these remarkable gems! I love the eggs with bluish shell. Glad to read you have access to good-quality eggs. Enjoy!